The fashion industry is vast, complex and opaque. Even if you are concerned about how the clothes you choose can impact people and the planet, it can be daunting or overwhelming to know where to start to equip yourself with the knowledge that will help you make informed choices. Fashion Revolution Week provides an opportunity to join forces with one another and collectively push for change, but if you don’t feel confident about asking tough questions, here’s how you can quietly start your own revolution using just the contents of your wardrobe. I am a professional dressmaker, and even if I have an exhaustive list of measurements and a mannequin padded to a client’s shape, I’ll still have to make adjustments to the garment I am creating during fittings. Not only is every body unique, but everyone has their own unique feelings about their body, and which parts of it they would rather reveal or conceal. One of the things we sacrifice when we choose cheap fashion is fit. A generic sized garment probably won’t fit anyone perfectly, but we can be reluctant to spend money on alterations when they might cost more than the clothes themselves. If you buy enough cheap pairs of trousers, one of them is bound to fit, right? As anyone who has ever reached the end of their tether in a high street fitting room (or at home surrounded by online purchases that all need returning) will know, this doesn’t often work out well. Instead of buying lots of cheap clothes that don’t fit, why not spend some of that money on making sure your clothes fit perfectly? Sewing courses (like the ones run by Sewing Bee producer The Thrifty Stitcher) can teach novice stitchers the basics in a few hours. Alternatively, if sewing isn’t your thing, support a local business by paying a tailor to perfect your wardrobe. The fast fashion cycle relies on ever-changing trends to persuade people that they constantly need to buy new clothes. Magazines that rely on brand advertising will praise a style in their “must have” column one month, only to deride it as “so last season” the next. My dad has an interesting theory about the recent craze for pre-distressed denim: he reckons it is a way to speed up the lifespan of a garment, requiring us to buy more products. Fabric that has been worn down with sandpaper or sprayed with chemicals isn’t going to last as long as pristine new fabric. 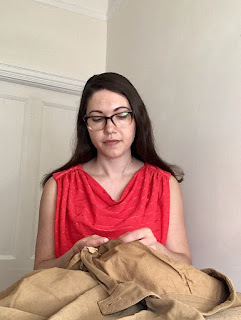 I think it’s part of the fun of owning clothes to naturally age them by wearing them, and refashioning or mending them as circumstances or personal style dictate. By developing this relationship with my clothes, I see them as valuable belongings rather than disposable items. A lot of us end up with clothes we don’t really wear because we feel obliged to buy them, especially for parties, weddings or other formal occasions. If you love having something new to wear that’s fine, but if your wardrobe is filling up with clothes that you have only worn once, you might need to re-think your approach. You can hire contemporary and vintage clothes for a special occasion; a designer label suddenly becomes more affordable when you only want the garment for a weekend. You could also search charity shops in a well-heeled area for other only-worn-once occasion wear. I’m not a big fan of dress codes, especially when they are designed to discriminate or make people uncomfortable. I have an aversion to high heels but I’ll wear fancy flats with a posh frock, and I think this is an acceptable compromise! It just isn’t worth buying clothes because you think you ought to; your own comfort will give you more confidence than clothes you’ve just bought to conform. I feel more comfortable being overdressed than underdressed, my main concession to practicality being my footwear! Of course, I wouldn’t wear a vintage evening gown to hike up a mountain, but I like wearing a skirt if I’m just going for a stroll. Finding a personal style that means you’re always comfortable is an important step towards buying less clothes that you won’t end up wearing. I know this is much easier for me to say than for many people to do. Factor in body-shaming and outfit-policing in the media, and “what not to wear” lists, and a purchase that you were looking forward to wearing ends up languishing at the back of the wardrobe for fear it will invite unwanted attention or criticism. I think we all could start to treat each other with more kindness and compassion in general, but we could all examine the snap judgements we make about other people’s outfits. Is it really any of our business if they dress in a way we wouldn’t want to ourselves? In its ideal form, fashion is meant to be a form of self-expression, to let the world know who we are, or who we aspire to be. This isn’t possible if we are being sold cheap, ill-fitting garments that don’t make us feel good about ourselves. It’s possible to create radical change if enough of us can break free from this cycle of dissatisfaction and obsolescence. Fashion Revolution offers template letters to send to brands and policy makers if you want to start asking Who Made My Clothes but don’t feel that you know enough about the subject, or the right questions to ask. Their website is full of helpful information, including access to their online zines, as well as their Transparency index. This provides information about well-known fashion brands and how much they disclose about their supply chain, so you can make well-informed decisions about where to shop. I would love to get to a point where I can just enjoy fashion in an uncomplicated way, without having to research every purchase or avoid a lot of shops altogether. We have a long way to go before that happens, but fashion is a creative industry and I am hopeful that enough talented and dedicated people are working hard to make a change. Until that happens, we can all be fashion revolutionaries by rejecting the negative aspects of the industry, supporting people who are making positive changes, and demanding positive changes from the multi-million-pound brands that have the resources to be at the forefront of change rather than lagging behind. 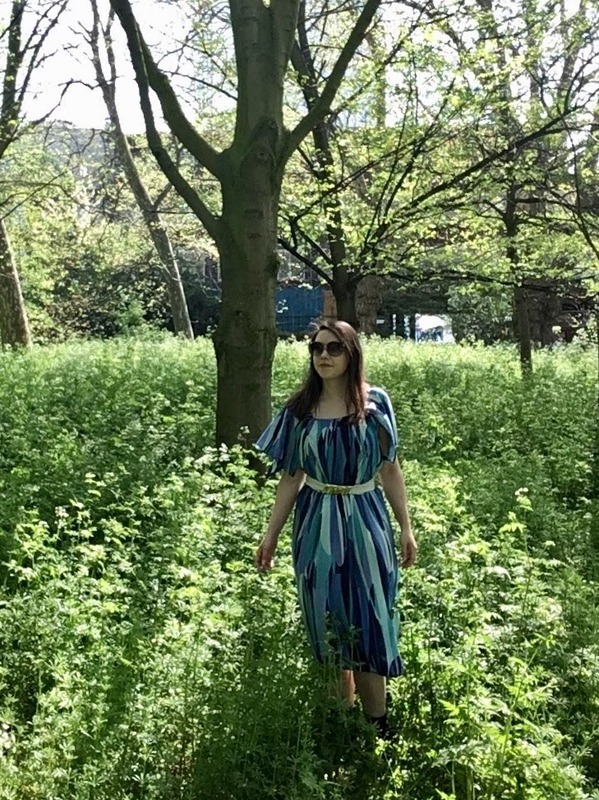 I was really shocked by the amount of clothes we’re wasting here in the UK: the average woman has £285 worth of unworn clothes in her wardrobe, and considering the price of fast fashion, that’s a lot of outfits we are missing out on! As a country, we’re hoarding £30 billion worth of unworn clothes, and the amount of clothes we discard every year could fill Wembley Stadium! This seems like a horrifying waste of the earth’s resources, the hard work of the people who make our clothes, not to mention our own money. 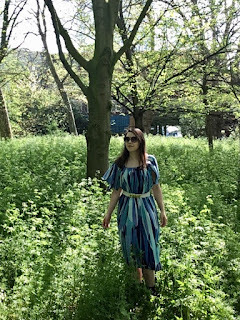 Writing this blog has made me very aware of the contents of my wardrobe, but I still buy vintage bargains that aren’t quite the perfect fit, or take hand-me-downs or swaps that go straight into a “to fix” pile. Fashion Revolution Week isn’t about horrifying statistics, it’s about making changes; calling for companies to make their supply chains more ethical and transparent, and also working out what changes we can make to our wardrobes to make sure we wear and love all our clothes. 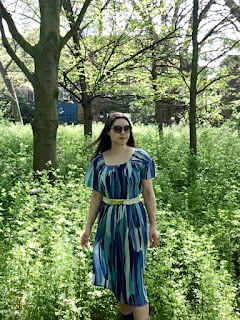 I’ve made some quick and easy alterations that have transformed three maxi dresses that weren’t really wearable into versatile clothes that I’ll want to wear all the time. 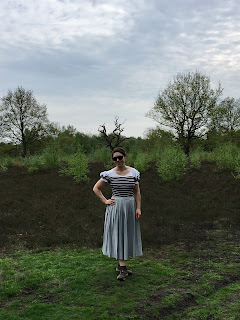 As I unpicked the grey dress at the waistband, I realised the skirt and top had been made separately and then overlocked together at the waist. The overlocker (a four-thread sewing machine with a blade to trim the seam allowance off) had cut a few holes in the waistband, but it was salvageable. I hand-stitched the waistband back together (if you keep your stitches small but not too tight, it’s not too difficult to hand-sew a stretch fabric) then inserted a band of elastic (use a safety pin attached to one end to push the elastic through the channel) and machined the ends together securely. Removed from the skirt, the wrap-over top seemed much too short, so I added a band of black jersey from my fabric stash, with narrower ties at each end. I machined a buttonhole onto the band that was wide enough for one of the ties to thread through, so the top would wrap around snugly and neatly. The red dress itself was easy to alter; I just unpicked the shoulder straps at the front, pinned the new shoulder draping on my dressmaker’s stand until I was happy with the result, then stitched the shoulder straps back on. The lining was another story; I put it on the stand to see how much fabric I had to play with; I pinned away excess fabric in the back and side seams, and gave the slip a nice neckline. I used the excess fabric from the side seams to make straps, and I was able to let down excess fabric in the hem so the slip is almost as long as the dress. A top tip that I used for both the slip and the grey skirt: use a synthetic thread if possible when you are sewing stretch fabrics; cotton thread is stronger but doesn’t have the “give” that will allow the thread to stretch with the garment. I decided I wanted to keep the blue print dress a bit longer in the skirt than I had originally planned; this meant that I had less fabric to work with so I had to re-think my original design idea, which was to make a little bolero or shrug to go with the dress. Instead of making a separate garment, I cut the leftover fabric in half along the side seams, hemmed each edge, and used the pieces to make a very simple sleeve that also functions as a shoulder strap. I put the dress on the stand to work out a pleating pattern over the shoulders so the sleeves would drape down nicely over my arms, then machined the pleats into place. 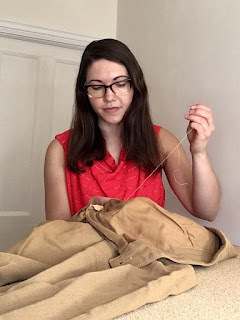 These aren’t the most groundbreaking or elaborate refashioning projects, but I wanted to do something straightforward; showing that altering your own clothes doesn’t have to be complicated or time-consuming. I didn’t draft any patterns, I just used what fabric I had, or pinned a new shape into place. Don’t be afraid of trying out an upcycling or refashioning project with an unloved item of clothing from your wardrobe. The worst-case scenario? You still won’t wear it, but you will have discovered new sewing skills. The best-case scenario will see you reunited with a unique piece of clothing that is truly “you”. Here’s my haulternative video; please have a look, and support Fashion Revolution Week by taking to social media to ask brands “who made my clothes?” I’ll have some extra content up on my Instagram during the week, and back on the blog on Friday, so check back soon. Can my pants improve the world and my well-being? As I replace worn-out items from my wardrobe, I’ve realised the importance of buying clothes that are good for me, as well as the planet and the people who make my clothes. Prioritising my personal style and comfort over feverishly following trends has helped me feel happier with my wardrobe overall, but there is one particular item of clothing where this has been particularly important. I suffer from vulvodynia and endometriosis, so a bad choice of underwear can be a pain in the bum - literally. Comfort, and soft, breathable fabrics are a necessity, so I had resigned myself to buying packs of basic cotton undies from the high street. They do the job, but at an average price that works out as only a couple of quid per pair, their makers are unlikely to be paid a fair wage, and the cut and shape is usually rather... uninspiring, shall we say? When you are dealing with conditions that sap your energy and your confidence, wearing boring pants isn’t going to help matters. I wanted to find some everyday underwear that was made under better conditions, and with a bit more design flair, but at a price that would make it an affordable alternative to fast fashion undies. One day I’d love to do a post about luxury ethical knickers, but for now I’m working on an alternative to the multipack of comfy pants. A go-to brand for ethically made clothing, People Tree also make a small range of underwear. These briefs are made from organic cotton with a pretty lace trim. They aren’t quite a full brief, but they don’t ride up or dig in and are a great fit. These sleek and seamless bamboo knickers are a great alternative to synthetic “no VPL” pants and come in a range of styles. I bought a high-waisted brief as well as a regular brief; the high-waisted style gives a great seam-free shape under fitted pencil skirts or dresses. Breathable but well-elasticated bamboo fabric make these pants a great choice for exercising. Every other month, Alice from LBPC sends you a pair of pants in a paper envelope that folds out into a zine featuring topics like intersectional feminism and garment workers’ rights. I love the cut of her vintage-inspired high waisted knickers, but if you prefer something a little skimpier she’s got you covered there (or not), as she makes a range of styles, and every purchase earns points that you can put towards bespoke items. I supported the Kickstarter for Y.O.U’s first capsule collection, and chose these cute shorts from their range of styles. As well as being ethically made (and another great No VPL style), Y.O.U also donate pants to people in need: usually to menstruating teenagers who would otherwise be unable to go to school. Considering periods (a perfectly natural occurrence for anyone with a uterus) a “taboo” subject has disadvantaged people all over the world and held them back, either from school, work, or well-researched medical treatment for a common but painful and debilitating condition like endometriosis. “Period poverty” is a problem in the UK, with teenagers too embarrassed to go to school if they don’t have access to sanitary products. Even people who are well-informed and unembarrassed by periods often won’t seek medical help because period pain is considered to be so subjective. It’s all too easy to think that maybe you just have a much lower pain threshold than people who don’t seem to suffer so much. It wasn’t until I fainted during my first official day at my new job and had to be sent home in a cab that I finally felt I had “proof” that my periods weren’t “normal”. It still took three years, and discouraging incidents when I was just dismissed from the doctors surgery with some painkillers, before I got a diagnosis and treatment to suppress the symptoms. If you’re struggling with painful periods or chronic reproductive-system-adjacent pain, please don’t suffer in silence like I did. Keep going back to the doctors until you have a treatment plan that you are happy with. If you suffer from vulvodynia this post on the Lingerie Addict blog by Catherine Clavering, the founder of lingerie brand Kiss Me Deadly, is a must-read; it was such a huge relief to know that I wasn’t alone. Support and information can also be found at Endometriosis UK. Being bombarded with information about global injustices can sometimes make me feel that I should be able to push my problems aside and focus on the “real” issues. My health problems are certainly not life-threatening, but they do affect my life, and I soon realised it was impossible to make a useful contribution to the issues I cared about when I was feeling run down and miserable. I have been trying to take my physical and mental wellbeing into account while making thoughtful purchases, and it’s turned out to be a great shopping strategy. I did worry that I would be limiting my choices by trying to buy underwear that fitted my requirements from strictly ethical or sustainable brands. I actually discovered that I had a great choice of styles to pick from (there are plenty of amazing brands that I haven’t bought from because they didn’t make the *exact* style of knickers that I like, but that other conscious customers would love) and I never had to choose between my personal comfort and my principles. Brands that care about the environment and their workers are also going to care about choosing quality materials and perfecting a well made, well fitting garment. So paying a few extra pounds for a feel-good knickers drawer is well worth it. As well as being an ethical fashion fan and general costume and sewing nerd, I also love geeking out about sci-fi and fantasy, and the way that futuristic or alternative worlds are brought to life. I do love a good future dystopia - Mad Max Fury Road being my current favourite - but when they start being referenced by politicians in a “this country won’t end up like that, honestly!” kind of a way, it’s a sign that things are getting too real and I need to look for my escapism somewhere else. I’ve been finding Star Trek’s utopian vision of the future very soothing, as well as loving their costuming choices (I wrote about my favourite fictional fashion icon, Lwaxana Troi, for Women At Warp) and their magical piece of zero-waste technology, the replicator. I don’t think the show has ever reliably explained how this microwave-sized machine can produce anything from a cocktail to a costume for a holodeck adventure (something to do with gel packs??) but I’m happy to suspend disbelief for the notion of a device that could make whatever you needed and recycle it for you afterwards. No trips to the charity shop or time spent separating glass, cans and plastics for the crew of the Enterprise. The closest we’ve come to a replicator so far is the 3D printer, which has been used to great effect to make unique costumes for fantasy films. Costume designer Ruth Carter cleverly fused tradition and technology to create a headdress and mantle for Angela Bassett as Ramonda in Black Panther. The garments feature traditional lace patterns, but were 3D printed to suggest the technological capabilities of the fictional African kingdom of Wakanda. 3D printing produces show-stopping costumes, but to make use of the full potential of this technology on a larger scale we need to find a way to use it to produce everyday items, preferably in a closed loop system so we are not adding to the problem of plastic waste. Dutch start-up w.r.yuma have done just this, making 3D printed sunglasses frames from recycled plastic bottles or reclaimed car dashboards. I supported their kickstarter in 2017 and received my fab sunnies earlier this year (just in time for the snow!) which come with a foldable case made from Portuguese cork. It was really interesting receiving updates as the making process was underway (I probably found the “outtakes” of the printers failing to print sunglasses - and creating little abstract sculptures instead - much funnier than I should have) and a reminder of the effort that small brands are going to in order to make a big difference. I wanted a suitable top to wear with my futuristic sunglasses, so I picked up a long-abandoned refashioning project: a cropped, short-sleeved sparkly silver sweatshirt. At some point in the past, I must have thought I’d rock a baggy cropped sweater (and been mistaken) as this is the second one I’ve had to refashion. It’s a good reminder that on-trend pieces are only worth adding to your wardrobe if they are going to work with your favourite clothes. I had already unpicked the sleeves and hem before abandoning the project, so I marked a new side seam, and used the pieces I had cut off to add an extra band between the shoulder and the sleeve to make the sleeves a bit longer. This has added a nice little design detail to a straightforward project, and the finished sweatshirt feels much more “me”. The project wasn’t completely zero-waste, but a handful of off-cuts that are only a few centimetres long isn’t too bad. The Barbican seemed the ideal location for some photos: it’s an amazing example of the futuristic architecture that was meant to usher in a new era of utopian living in post-war Britain, and there’s a slightly fantastical element to it (I can never find my way in by the same route twice!). Of course, the weather in Britain being what it is, it had snowed the day before we had planned to go there, so I wore a second-hand velvet skirt and vintage boots to complete the outfit. I hope my zero-waste outfit will encourage other people to realise that futuristic fashion isn’t just the stuff of fantasy films, it’s becoming accessible to us here and now, and we can (and should!) support the innovators who are making closed-loop clothes manufacturing a reality. The fifth Fashion Revolution Week is happening this April, from the 23rd to the 29th. Originally set up to call for change after the Rana Plaza factory collapse in 2013, in which 1138 garment workers lost their lives and many more were injured, Fashion Revolution has grown into a movement to promote transparency and sustainable working practices across the fashion industry. The simplest way to participate is to take to social media to ask brands “Who Made My Clothes?” Increased transparency in the industry’s global supply chains means that exploitation of workers is less likely to go unchallenged, and helps us all to remember that our clothes are made by people, not machines. Fashion Revolution also challenges us to form a different relationship with our clothes: to resist seeing them as disposable, to choose clothes we love and look after them properly, and to see their potential as possessions that can change with us. 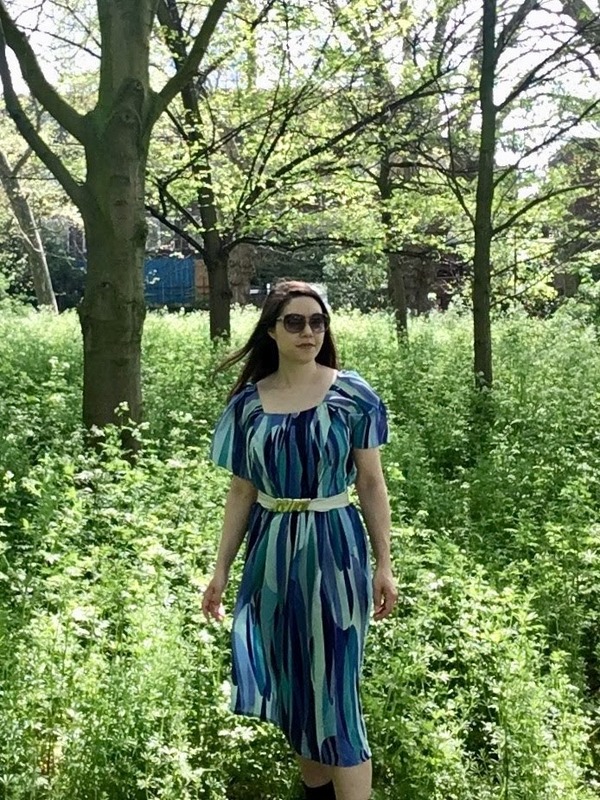 I’ve made a “haulternative” video for Fashion Revolution Week: instead of showing off a heap of fast fashion purchases in a “haul” video, I’m showing off three maxi dresses that aren’t earning their place in my wardrobe, and discussing the alterations I’m planning to make. The first dress might look familiar to people who have been following my blog for a while; I acquired two of these dresses from sample sales via someone who worked as a buyer because I loved the fabric, but the skirts aren’t full enough for me to walk normally while wearing them! I refashioned the first one into a jumpsuit, and I’m going to shorten this one to knee-length and use the leftover fabric to make a little sleeveless jacket, to create a late 50s/early 60s-style two-piece “costume”. This grey maxi was a hand-me-down from my sister. I love grey, but this much grey doesn’t do wonders for my skintone (I’ve had to crop my feet out of this picture because they looked distinctly corpse-like) so I’m going to split the dress into two pieces along its waist seam, and flip the top around so I end up with a maxi skirt and wraparound top. I’m going to keep this red dress (found on the bargain basement rail of a vintage shop) as a maxi dress, but I need to make a few alterations before I can wear it. The cowl neckline is a bit deeper than I’d want for a wearable day dress, and the lining situation is rather strange. The top has no lining at all, and the skirt has a lining that is only sewn in at a few strategic points as it doesn’t stretch as much as the dress does. I’m going to detach this lining and make it into a slip, so I can preserve my modesty and feel more comfortable wearing the dress. You can follow my progress as I work on my alterations over on my Instagram, and I’m also doing an Instagram stories takeover for The Up Effect on Sunday 8th April so give them a follow and see what I’m up to. I’ll be revealing my refashioned dresses in all their glory during Fashion Revolution Week, hopefully in another video, so stay tuned!